The Mesozoic Era (252 to 66 million years ago) had a lot of “firsts”. For example, it had the first birds, first mammals, first dinosaurs and first flowering plants. 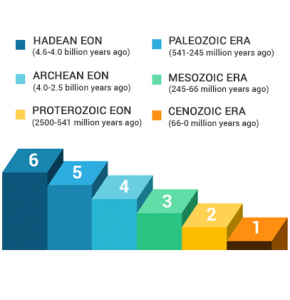 Not only was this a significant era for evolution, but also for climate and tectonic activity. Pangaea started rifting into separate continents from one giant landmass. And Earth’s climate was dry. Though opinions vary, it’s believed to have had its highest oxygen levels in history. Remember the Paleozoic Era just before underwent a remarkable diversification in life (Cambrian explosion). It was only to end in the largest extinction event in Earth’s history (Permian-Triassic Extinction). But life didn’t completely vanquish at this point. When Earth’s climate became hotter and drier, rainforests began to collapse. Deserts swept the land and left islands of forests. Reptiles were different because they could lay their hard-shelled eggs on land. By cutting ties with the ocean, reptiles adapted to life on land. Amphibians already partially evolved to land conditions. But reptiles were larger and could travel longer distances. They gained an ecological advantage because they had less competition for food in dryland conditions. This triggered the start of the age of reptiles. As conditions changed, dinosaurs (also known as terrible lizards) began to evolve. Similar to reptiles, they had scaly skin and hatched eggs like reptiles. At the same time, conifers filled the landscape. In addition, oxygen levels increased to 35% compared to 21% today. The theory is that gigantism correlated with oxygen content in the atmosphere. Higher oxygen levels meant more size and mass. There is varying opinion on oxygen levels in the Mesozoic Era. Regardless, these reptile-like mammals grew extraordinarily in size. For the next 160 million years, dinosaurs were the dominant land vertebrates on Earth. This existed until the Cretaceous-Paleogene extinction. Vegetation was very different in the Mesozoic Era. Plants were less diverse. And conifers began dominating the landscape. Conifers store vast amounts of carbon. They really changed the chemical makeup of the atmosphere as carbon storage was believed to have jumped at this time. 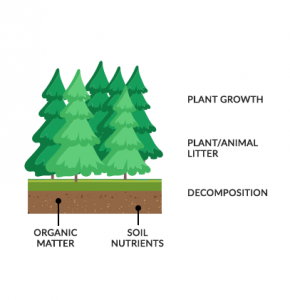 At the bottom of the food chain, plants became an essential source of food. Some dinosaurs adapted as carnivores and some as herbivores. But most dinosaurs were plant-eaters and snacked on plants like conifers. This means their biological success was tied to specific varieties of plants. Without them, there would have not been dinosaurs or any other animal. After the extinction of dinosaurs, geologists have dug up fossils from around the world. They’ve kept a thorough record documenting the species and location. 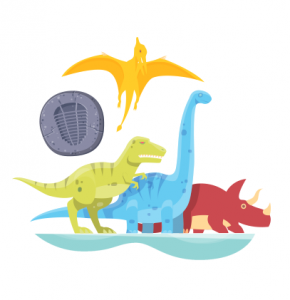 The first thing geologists found was that some dinosaurs were better suited for water, air and land. For example, pterodactyls preyed upon fish from the sky. But the lystrosaurus was a herbivore and ate small plants on land. The second thing geologists uncovered was the distribution of fossils on land. For instance, they found lystrosaurus fossils in India, Africa and Antarctica. So how can land herbivores exist on separate continents? They didn’t fly. Nor did the swim. The reason is because Earth existed as one giant supercontinent Pangaea. But over time, the land masses separated apart into the 7 continents and 5 oceans that we see today. Now we know that plate tectonics was the mechanism that tore continents apart. Because of the fossil evidence, we know the Mesozoic Era experienced significant continental rift. Reptiles and dinosaurs dominated the Mesozoic Era. But it was also firsts for birds, mammals and flowering plants. Other than the significant evolution in the Mesozoic Era, climate and tectonic activity shaped the landscape. 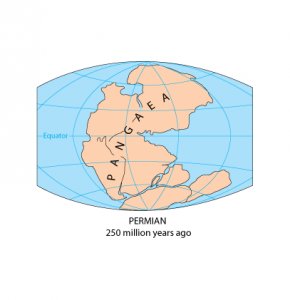 For example, Pangaea started to separate. Eventually, this continental rift into our modern land configuration. But as we know, dinosaurs went extinct at the start of the Cenozoic Era, only for mammals to emerge as the dominant species.